Christ Church Cathedral (The Cathedral of the Holy Trinity, commonly known as Christ Church, Cathedral of the United Dioceses of Dublin and Glendalough and Metropolitical Cathedral of the United Provinces of Dublin and Cashel) in Dublin is the elder of the city’s two mediæval cathedrals, the other being St. Patrick’s Cathedral. It is officially claimed as the seat (cathedra) of both the Church of Ireland and Roman Catholic archbishops of Dublin. In practice it has been the cathedral of only the Church of Ireland Archbishop of Dublin, since the Irish Reformation. 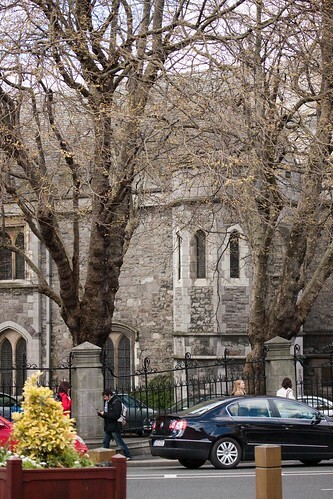 Though nominally claimed as his cathedral, the Roman Catholic Archbishop of Dublin uses a church elsewhere, St Mary’s in Malborough Street in Dublin, as his pro-cathedral (acting cathedral). Christ Church Cathedral is located in the former heart of mediaeval Dublin, next to Wood Quay, at the end of Dame Street (the latter owes its name to a Norman French title given to Our Lady). However a major dual carriage-way building scheme around it separated it from the original mediaeval street pattern which once surrounded it, with it original architectural context (at the centre of a maze of small buildings and streets) lost both by road-building and by the demolition of the older residential quarter at Wood Quay. As a result the cathedral now appears dominant in isolation behind new civil offices along the quays, out of its original mediaeval context.